Did you know you can file your Civil Domestic Violence Protective Order (50b) without going to the courthouse? 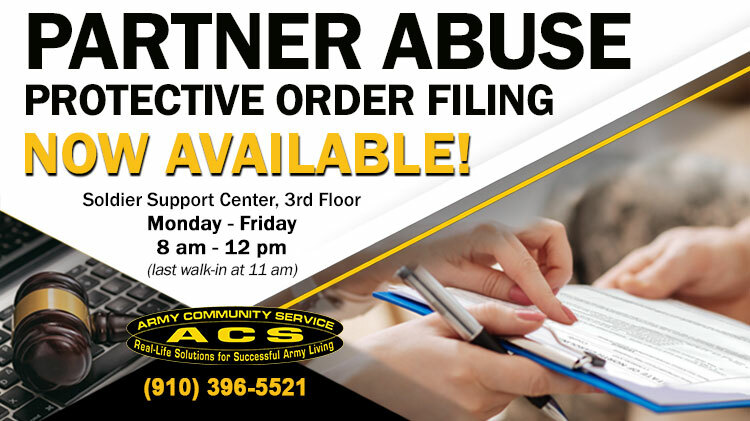 Partner Abuse Protective Order Filing is now available at the Soldier Support Center, 3rd Floor, Monday through Friday from 8 a.m. - 12 p.m. (last walk in or appointment at 11 a.m.). If you are in a domestic abuse crisis situation and need assistance, ACS can help E-File your DVPO quickly, no appointment necessary! Call (910) 396-5521 for more information. This service is available to all Service members, their Families and retirees (military ID cardholders).